Nominate fish-hawk subspecies frae Nagarhole Naitional Pairk. 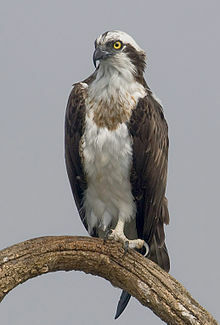 The fish-hawk (Pandion haliaetus) is a bird o prey. It bides aboot the lochs o northren Scotland. It eats fish an ither wee beasties. ↑ BirdLife International (2013). "Pandion haliaetus". IUCN Reid Leet o Threatened Species. Version 2013.2. Internaitional Union for Conservation o Naitur. Retrieved 26 November 2013. Wikimedia Commons haes media relatit tae Pandion. This page wis last eeditit on 14 Februar 2017, at 02:28.